The sample is placed on the prism and is illuminated by aligning the chrome-plated reflector with a suitable light source (day light or optional light source with intensity control). Adjustment of the Achromatising prisms provides a means of ensuring the reading is obtained at the correct frequency (589nm for standard measurement). The borderline may then be observed through the single eyepiece and the reading in either Refractive Index or Brix may be taken from the integral scale. The instrument may be configured to work in either the traditional ‘transmitted mode’ or for non-homogenous or opaque samples, ‘reflected mode’ may be chosen. Dispersion measurements of hydrocarbons or solids materials such as glass, contact lenses and fibre optics may be made in accordance with standard practice. Waterbath connections provide prism temperature control, with the prism temperature being monitored electronically and displayed on the integral digital display. With good temperature control and precise calibration, readings may be obtained to 4 decimal places RI or 1 decimal Brix. 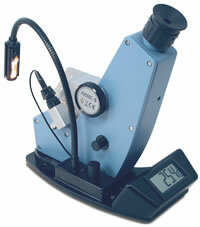 The Abbe 5 refractometer is supplied with a glass calibration plate, contact liquid, and instruction manual and is packed in a hard flight case for easy transportation and storage. Limited warranty is 24-months. 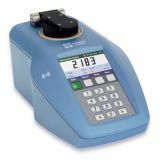 44-501 Abbe 5 refractometer supplied with glass test plate, contact liquid and instruction manual packed in a hard flight case for easy storage. Selectable temperature display in °C (Centigrade) or °F (Fahrenheit). 44-590 Spare prism box assembly. 72-200 Traceable calibration plate (silica: 1.45839 ± 0.0001 RI at 20 °C). 10-43 Contact liquid (monobromonapthalene) for test plates and solid samples with an RI up to 1.65 RI. Quantity 6ml. 10-61 Contact liquid (methyl iodide) for test plates and solid samples with an RI up to 1.74 RI. Quantity 6ml.